Astronomers have found the farthest known galaxy in the universe—again. Less than a year after measuring a galaxy 13.1 billion light years into the past, they have measured a galaxy whose light took 13.4 billion light-years to reach Earth. Described by its discoverers as “surprisingly bright,” the galaxy, named GN-z11, is located in the direction of the constellation Ursa Major. Its measurement allows scientists to peer at light from a period just 400 million years after the big bang. The researchers made the measurement using NASA’s Hubble Space Telescope. Previously, astronomers had estimated GN-z11’s distance by determining its color through imaging with Hubble and NASA’s Spitzer Space Telescopes. Now, for the first time for a galaxy at such an extreme distance, scientists used Hubble’s Wide Field Camera 3 to precisely measure the distance to GN-z11 spectroscopically, by splitting the light into its component colors. Astronomers measure large distances by determining the “redshift” of a galaxy—a phenomenon caused by the expansion of the universe. Every distant object in the universe appears to be receding from us because its light is stretched to longer, redder wavelengths: the greater the redshift, the farther the galaxy. 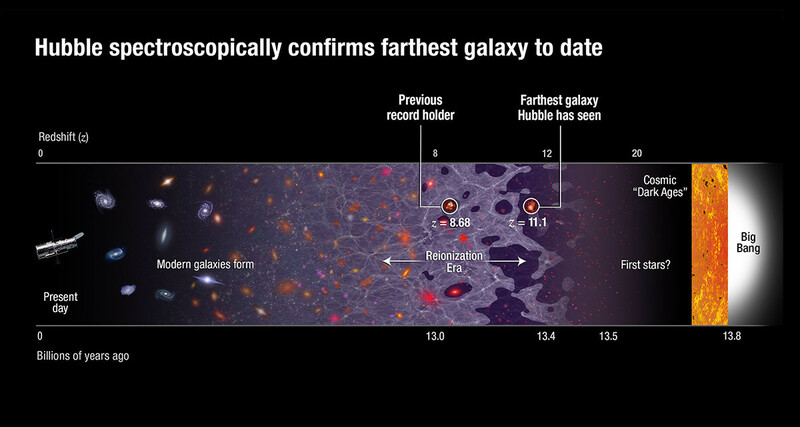 “To our great surprise Hubble measured a redshift of 11.1, much larger than the previous record of 8.7. It’s an extraordinary accomplishment for the telescope, as it managed to beat all the much larger ground-based telescopes that held the previous distance records for years,” says coauthor Pieter van Dokkum, chair of the astronomy department and professor of astronomy. The measurement builds on and uses the same techniques first developed as part of the successful 3D-HST survey, led by van Dokkum, who says the new distance record is likely to stand until the launch of NASA’s James Webb Space Telescope in 2018. GN-z11 is 25 times smaller than the Milky Way in size and has just 1 percent of our galaxy’s mass in stars. However, GN-z11 is growing fast, forming stars at a rate about 20 times faster than our galaxy does today. This makes the remote galaxy bright enough for Hubble to find and perform detailed observations.